Auctiva allows you to add as many consignment items to a consignor as you may need. This tutorial will show you how to add a consignment item. Make sure you have already added the consignor to your Auctiva account before adding the item. Read the Add Consignor tutorial to learn more. You will assign the item to the consignor from the Auctiva One-Page Lister. Consignment items can be created in two different ways. The easiest way is to assign a listing as a new consignment item from within the Auctiva lister. The other way is to add the consignment item from the Manage Consignment Items page and then associate that item to a listing from within the Auctiva lister. The latter method requires an additional step. This tutorial will cover the simpler method. Step 1. Load a listing on the Auctiva One-Page Lister. In this step, you will create a brand-new listing or create a new listing from a similar listing. If you need to assign a pre-existing listing (i.e., a listing in your Saved Listings folder) to a consignor, skip to Step 2. 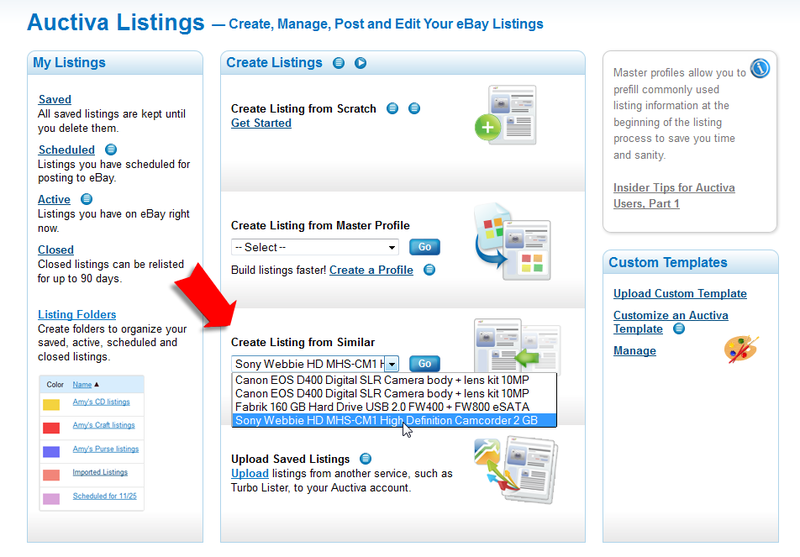 To create a brand-new listing, hover your mouse over the Listings tab and click on the Create New button (Figure 1.1). This will load the Auctiva lister. Figure 1.1. Create a new listing. To create a new listing from a similar listing, hover your mouse over the Listings tab and click on the "Create Similar" link (Figure 1.2). Select a similar listing from the drop-down menu in the "Create Listing from Similar" section (Figure 1.3). Click on the Go button and skip to Step 3. If the listing you are looking for isn't in the menu list, skip to Step 2. Figure 1.2. Click on the "Create Similar" link. Figure 1.3. Create a listing from a similar listing. Step 2. Edit a pre-existing listing. Hover your mouse over the Listings tab and click on the "Saved" link (Figure 2.1). 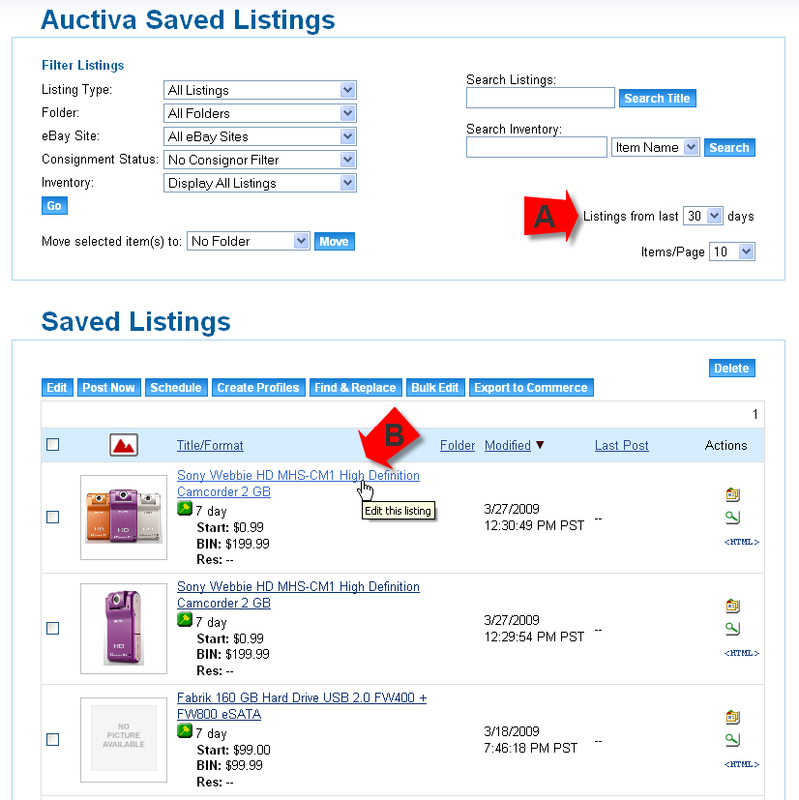 The Auctiva Saved Listings page will load. Change the "Listings from last 30 days" option (Figure 2.2-A) if you can't find the listing you want to edit. Figure 2.1. Go to the Saved Listings page. Figure 2.2. Recent listings filter option (A). Click on a listing title to edit the listing (B). When you find your listing, click on the title of the listing that you want to assign to a consignor (Figure 2.2-B). This will load the listing into the Auctiva lister. If you want to create a new listing from this listing that you've selected, scroll down to the bottom of the page in the Auctiva One-Page Lister and click on the Save as New button. This will save this listing as a new, separate listing. Step 3. Assign the listing to a consignor. Now that you are in the Auctiva lister with the listing that needs to be assigned to a consignor, you can fill out or edit any of the fields as necessary to create this unique consignment item. In the Item Details section, just below the Item Description, select the "Is this a consignment item?" checkbox (Figure 3). When selected, new fields will display. 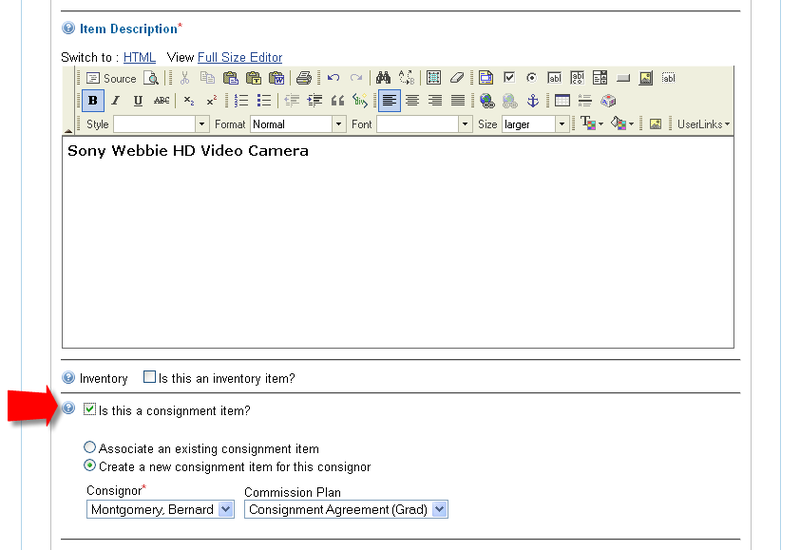 Choose the "Create a new consignment item for this consignor" option. Consignor: Select the consignor for this consignment item. Commission Plan: Select the commission plan for this consignment item. Figure 3. Consignment item options. Make any other edits/changes to the listing. Click on the Save button at the bottom of this page. This completes the task of creating a consignment item. This item will now appear in the Manage Consignment Items page. To get to this page, hover your mouse over the Sales tab and click on the "Manage Consignors" link in the Consignment section. In the Manage Consignment Accounts table, find the consignor that has been assigned the consignment item. From the Actions drop-down menu, choose the "Manage Items" option. The Manage Consignment Items page will load.